East Gate Kids Learning Center exists to provide well-balanced, values-based programming to meet the developmental needs of every child. East Gate Kids is working with the Focus Program and have received our 5 Star verification. We are continually improving our program and are currently working toward achieving National Accreditation. 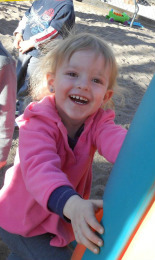 Our program has some of the best playgrounds and playground equipment in Albuquerque. We recently created a community garden for our children and families as well. Come see why we are the best of the best! We believe each child is unique, with his or her own distinct personality, background, and learning style, and we strive to be responsive to those individual differences. required 45 hour certification training. Many of our teachers have either already completed, or are currently pursuing, further education. Rather than simply operating a day care, we envision a facility where education, including Christian education, is an essential component for children to reach their full potential in readiness for school. When it comes to the safety of your child, there’s no such thing as being too careful. That’s why EGK childcare employs ProCare™ software. This proprietary technology allows our staff instant access to your child’s medical information, arrival and departure times, and the names of people authorized for drop off and pick up. To ensure your child’s safety, it is our strict policy that only authorized personnel are admitted into our secure building. In addition to security, we believe children learn better when they feel safe in a comfortable environment. To learn more about our heart for children, schedule a tour today!